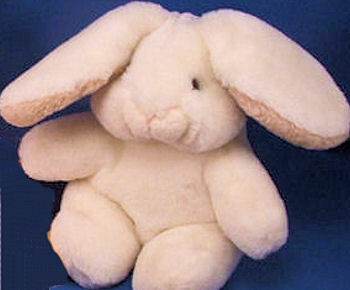 Hello, I recently ordered a WHITE GUND LOP EARED RABBIT (1982) from your website, and I have been trying to locate one for 20 years. I was wondering if there was any way to locate another. I would be willing to purchase as many as you could find. That stuffed animal has extreme sentimental value to me and, after 20 years of my whole family trying to find them, it brought tears to my eyes when the search was finally over thanks to your wonderful website! My father gave me two of them when I was born, and even to this day as a 25 year old, I still need them with me at all times, but unfortunately there is barely anything left to them, and it’s been that way for a while now. That is why we have been so desperate to find new ones. I am so greatful for your website, because the second I recieved my order it brought me back to that sense of comfort that I had when I was a little girl. Can you help me locate more? I am willing to buy as many as I can find, but if anything, I just need one more to complete the pair I’ve always had. Think this is the rabbit but you might want to think best offer? Pricey.